Interested in raising geese on your homestead? Primarily kept as pets, geese are intelligent, relatively self-sufficient and pretty hardy. When most of us think of geese, we envision burly, black-capped Canadian geese, flying in a v-formation and honking all the way down. But not all geese fly south for the winter — some are content to stay put on your homestead all year. They are also relatively self-sufficient. Unlike chickens who need coaxing a special conditions to effectively raise their young, geese can hatch and raise their own. “They’re very good parents,” Metzer says. “They are even adoptive parents,” he says. Pairs of geese, even those who aren’t broody, will often take care of orphaned goslings. 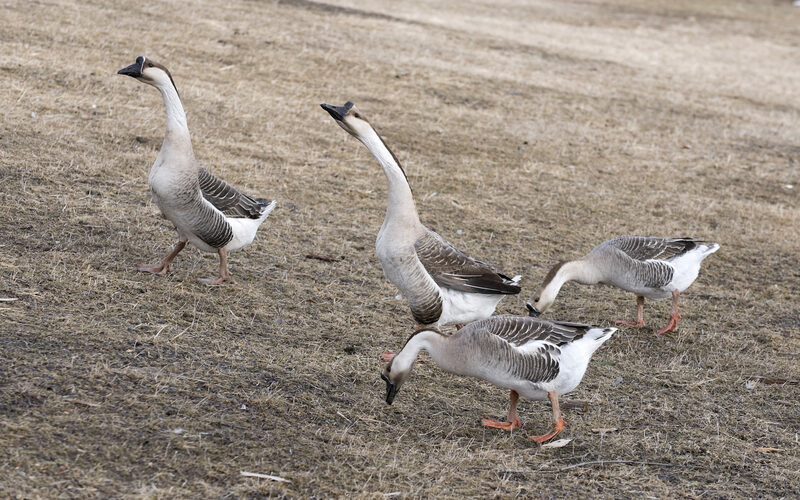 If you want some smart birds squawking around your homestead, here are the first things you need to know about raising geese. What are geese good for? Your pet geese will work for their keep, though. Geese are like living lawnmowers for your homestead. The big birds dine primarily on grass, so if your lawn is overgrown and out of control, a couple geese will help control the problem. While most geese aren’t raised for eggs to eat like chickens or ducks (though goose eggs are much larger and richer in flavor), goose eggs are the pinnacle of the decorative arts. “Blowing” is a process by which the goopy insides of the egg are removed through a tiny hole without compromising the overall integrity of the shell. “We blow almost all of our infertile goose eggs to sell to artists and hobbyists,” Metzer says. You can blow your own eggs to make DIY Christmas ornaments or Easter decorations. What do you feed domestic geese? Ideally, geese should be munching mostly on grass. To supplement their diets, any grain or prepared feed will work for domestic geese. They also enjoy leafy greens like cabbage, lettuce, and cauliflower leaves for a treat. Can you raise geese with chickens? Geese can be raised with other farm fowl. There are no specific or different requirements for the coops except the added space (between 8 and 10 square feet per goose should do). “Whenever you mix species, usually they can coexist as long as you give them enough room to get away,” Metzer explains. In general, though, geese are friendly birds brimming with personality. Metzer says that geese are more likely to cuddle and show affection than other birds, even nuzzling their necks around their owners’ arms or shoulders like a little hug.